I've seen several mentions of plans to use the 320i inner cv joints when installing a limited slip diff from a 320is but didn't find any posts about how it went. Most were aiming to avoid both using spacers and redrilling the diff output flanges. I was only concerned about avoiding the latter. I decided to take a few photos along the way to document what I found. There are lots of articles about other aspects of the swap so I'm just focusing on the dimensions of the axles below to supplement what's already out there. 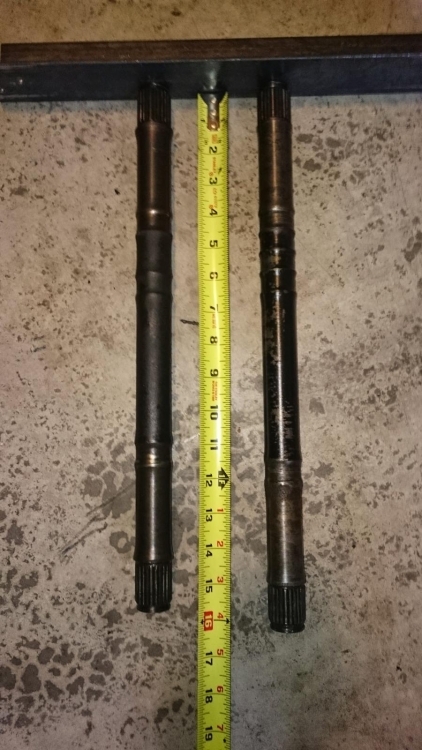 Redrilled output shafts would be a much easier approach with minimal downtime if your 02 CV joints are still good. I wasn't so lucky. I knew I had one bad '02 CV joint and the other three had dry, cracked boots so I'm repacking four cv joints regardless.I purchased the 320 halfshaft assemblies with the differential. The 320i joints looked pretty good, without any tears in the boots but they were cracked and due for replacement as well. I figured I could salvage two good 320i joints, and at least two of my '02 joints should be good. Lots of posts I read on the topic were asking if this approach would allow installation without spacers. I didn't find any posts confirming it would work so I ordered a pair of IE spacers drilled to 10mm for the 320 cv bolts, and a longer set of bolts just in case. 1976 2002s are unique as well. You'll apparently have it easier than most by just swapping your 2002 diff flanges into the e21 diff. 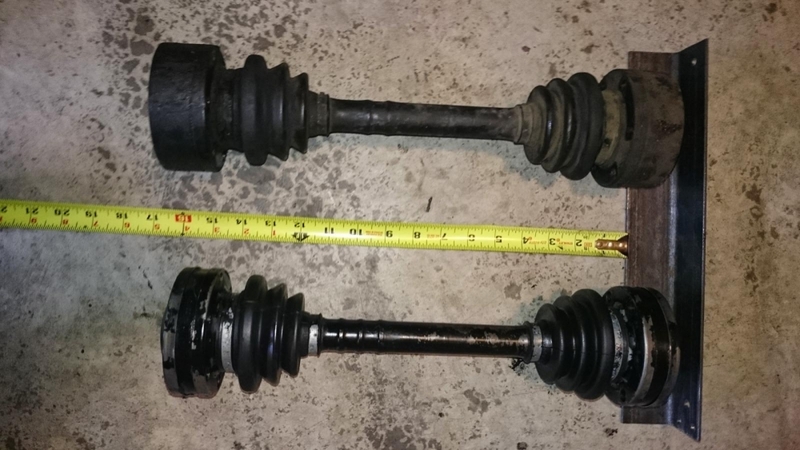 The 2002 axle is on top, the 320i on the bottom. CV joints are fully compressed for consistency. As you can see, the 320i halfshafts are quite a bit shorter overall than the 2002's. The CV joints themselves are quite a bit thinner, too. I started to question whether this was going to work but I decided to press on and see what the axles look like. 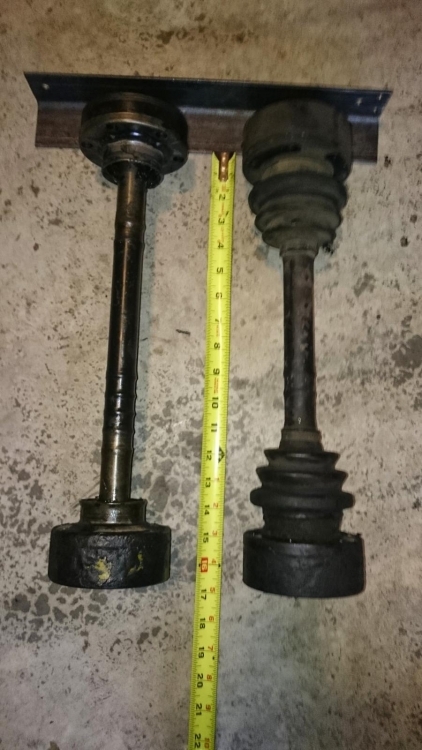 The 320i axle is on the right. Quite a bit longer than the 2002 axle on the left. There's still hope! Next, I test fit a 320i cv on one end, and an 02 cv on the other end of a 320i axle. My other '02 halfshaft is shown here for reference. Again, both are fully compressed. They're the same length! Since the 320i differential is narrower than the '02 diff, this means I'll probably use the spacers. I checked fitment on the car and while the CV flanges could reach the diff and stub axle flanges without the spacer, the spacer moved the cv joints closer to the center of their range of extension both at parallel to the ground (shortest flange to flange distance), and at full droop (greatest flange to flange distance). 10/15/15- Checking back after ~1 year and a few thousand miles. Everything is still working great. I have this with my LSD in my 2002 and have not had a single problem, and I did not need spacers of any kind on my 74. I got the set up along with the LSD I purchased from another o2'er. I think it is the 2002 half shafts with the 320 CV on the inboard side, (but I could me mistaken). There should be other posts on this conversion. I think the early 320 half shafts were different from the later ones, so it might be a little more specific on which parts you source and use. Thanks for this post. Great information to work from. Your problem is that the E21 320i CV joints you are using are from a late car. You need a pair from a '79 320i. Those are much thicker than the later ones! There is an old thread about this which I contributed to. The other option is to find a pair of very late '02 diff output flanges, that are the clip in style like the E21 diff, but wider and use the 8mm bolts. You would then use the standard '02 axels and joints. Thanks for the post. I googled the diff swap looking for axles. This thread was atop my search. I think I was a member of this site about ten years back. About 15 years ago I performed this swap and forgot what I used for axles. Finding any 2002s or 320s in the yards is tough now. I'm grateful for the thread and all the feedback. I'm not sure what I will come up with for parts. Is the late E10 diff flange option a plug and play or do you have to machine a groove in it? I know of a late Diff around town. Haven't been back here in a while. Time for an update. Added some clarification as well based on what Russell and TJones posted. Russell-It seemed like both with and without the spacers were within the range of extension/compression that the CV joints could accommodate. I happened to have the spacers and as mentioned above, felt they provided the better compromise. They're fairly cheap, so having the option in hand before I started seemed like a good idea. TJones02- I mentioned the year of the donor and my car since there were a few different CV joint combos available across the 2002 and 320i. I'll clarify above.